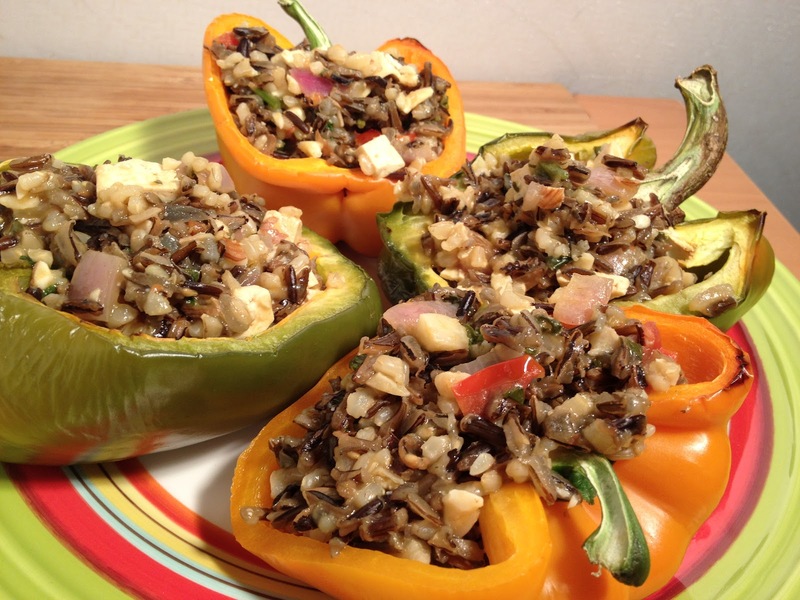 This recipe, Elegantly Simple Stuffed Bell Peppers, is also from The Vegan Table. The author, Colleen Patrick-Goudreau has another book too: the award winning, The Joy of Vegan Baking. I really prepared this recipe on point! This not only looks great but is absolutely delicious, fulfilling and professional looking. It’s almost as if I can cook! Bell peppers- The recipe says 6 but I used 4 which made 8 servings. Prepare the rice first as that takes the longest. I used a mix of wild rice and brown rice. I generally use a ratio of 2.5 cups of water to each cup of rice. Halve the peppers lengthwise and leave the stem on if you can. Scoop out the insides and place the peppers into a slightly oiled baking dish. Brush the insides with some olive oil. Pour one cup of water around the peppers. Bake for 15 minutes. In a soup or rice pot, heat enough vegetable stock or water to sauté the onions and garlic. Add the tomatoes and spices. Turn off the heat and add the cooked rice, sliced or crushed almonds and the raisins. I forgot to add the raisins which would have been really good. I also didn’t read the recipe all the way through until now oops again! Next you stuff the peppers with the new mixture which I did and they were perfect right here! The recipe says though to bake them again for 15 minutes. Garnish with ground almonds and herbs. Patrick-Goudreau, C. (2009). The Vegan Table. Fair Winds Press: Beverly, MA.